Dinosaurs and QTEs, oh my! I was ten years old when Jurassic Park came out in 1993, but I still very distinctly remember it was a movie-going experience like no other. The theater was packed, with people standing up against the back wall just to get into the sold-out show, and despite the claims of blood and gore, my father had taken me and my two younger brothers to this dinosaur movie, and it was probably the first movie that we were all in agreement about when it came to the sheer excitement of seeing those dinosaurs onscreen. Not only was the movie amazing, but my parents actually did something unprecedented after that first viewing: took us to see it again less than a week later. It was just that good. This feeling of epic wonder upon first viewing Jurassic Park is exactly what Telltale Games is trying to capture with their episodic video game adaptation. The developer has found a seemingly perfect leading-off point where the movie and game plots collide: the fate of Dennis Nedry's shaving cream can full of dino embryos. In the original Jurassic Park, the can was seemingly lost after the Dilophosaurus attack on Nedry. Now a new group of people is trying to get that can, and the millions of dollars it's worth on what I like to imagine is the dino DNA black market. The demo I viewed today had two eager embryo-hunters and colleagues of Nedry stumble upon his spit-covered corpse in the jeep, at which point Nima realizes that this job is more than she signed on for. Jurassic Park is a huge change in gameplay style for Telltale, a company known mostly for a more traditional point-and-click approach. It's still an adventure game at heart, with situational button prompts directing you and making you aware of your options. Unlike most adventure games, your choices do carry some weight, and might even make a difference between who lives and who dies. Messing up doesn't automatically mean the character that you're controlling will meet a grisly end - but someone else in your party might. While simply hitting buttons when prompted probably doesn't sound too difficult, as games like Heavy Rain have proven, it can be very easy to slip up in tense situations when you only have a second to react. Jurassic Park is full of moments like these, with the developers really focusing on pacing, drama, and intensity to create a cinematic experience. A dialogue wheel is also available, and as you take control of several different characters throughout the five episodes, you'll be able to choose how they react to any given situation. The game also expands on the already existing Jurassic Park universe, and you'll be able to explore areas only referenced in the movie. A variety of dinosaurs can be spotted throughout the park, including one brand-new species that apparently takes a stealthier approach to hunting its prey. Even though the game engine Telltale has used for years is showing its age, I was extremely impressed by what I saw of the first episode of Jurassic Park today. I'm not sure I would trust a lot of developers to take on this franchise, which has already had some massive failures in the gaming world, but in Telltale's hands, I think the park is safe. Well, as safe as an island full of bloodthirsty dinosaurs can be, anyway. 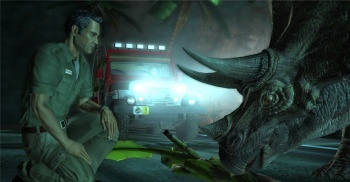 The first episode of Jurassic Park will be out in the fall of 2011 for PC, Mac, iOS, PSN, and XBLA.